Accumulating evidence indicates that monocyte chemoattractant protein-1 (MCP-1), a CC chemokine, also displays immunoregulatory functions and may be involved in Th subset differentiation. In this study, we examined the effects of MCP-1 on the cytokine-driven differentiation of monocytes into dendritic cells (DCs), the most potent APCs for naive T cells. We found that DCs generated in the presence of MCP-1 displayed a markedly reduced production of IL-12 in response to CD40 ligand but not in response to Staphylococcus aureus stimulation in the presence or absence of IFN-γ. The production of IL-10, a potent endogenous IL-12 inhibitor, was not affected by MCP-1. Whereas the inhibitory activity of MCP-1 on IL-12 production by monocytes was sensitive to pertussis toxin, its effects on DC differentiation were pertussis toxin resistant. MCP-1 did not affect the surface phenotype and T cell-stimulating activity of DCs, but most interestingly, naive T cells stimulated with MCP-1-primed DCs produced much less IFN-γ but the same levels of IL-13. Taken together, our results indicated that MCP-1 modulates the differentiation of monocytes into DCs and may thereby inhibit Th1 cell development. Chemokines were initially considered chemotactic cytokines. It is now apparent that their biological activities encompass effects not only on the recruitment of inflammatory cells but also on angiogenesis, hematopoiesis, and activation of immunocompetent cells (1). The close and intriguing association of chemokine receptor expression on CD4+ T cells with Th1 or Th2 cell phenotype supports the notion that chemokines may participate in Th1- or Th2-type immune responses by modulating the migratory patterns of effector T cells (2, 3). Moreover, several studies have suggested that chemokines influence Th subset differentiation, either directly or indirectly (4, 5, 6, 7, 8). Monocyte chemoattractant protein-1 (MCP-1),4 a CC chemokine initially identified as a monocyte-specific chemoattractant, has now been shown to attract activated T cells, NK cells, and basophils, as well as monocytes (9). MCP-1 binds to seven-transmembrane-spanning proteins, such as CCR2, Duffy Ag/receptor for chemokines/Duffy, and D6 (10, 11). CCR2 is the only known functional receptor for MCP-1 and is linked to downstream signaling pathways through heterotrimeric G proteins (10). MCP-1 is postulated to play pivotal roles in the pathogenesis of a variety of diseases characterized by mononuclear cell infiltration, such as rheumatoid arthritis and bronchial asthma (12, 13). A number of studies have shown that MCP-1-deficient mice exhibit attenuated Th2-type responses with a shift to Th1, as well as increased resistance to Leishmania major infection (14, 15). In contrast, CCR2-knockout mice have a markedly attenuated T cell IFN-γ response, defects in the clearance of intracellular pathogens, and increased resistance to Th1-mediated diseases (8, 16, 17, 18). Thus, although the in vivo observations indicated that MCP-1 and CCR2 are involved in effector T cell differentiation, their precise role remains to be determined. Primary immune responses are initiated by dendritic cells (DCs), which inform naive Th cells about invading pathogens, providing an Ag-specific “signal 1” and a costimulatory “signal 2” (19). Because myeloid DCs that develop and mature in different conditions are functionally different, Kalinski et al. (20) proposed a new concept according to which migrating DCs carry an additional “signal 3,” regulating the commitment of naive T cells to Th1 or Th2 subsets. It has been reported that, in vivo, activated monocytes may differentiate into DCs migrating to lymphoid tissues (21) and that IL-12 production by activated human monocytes, but not DCs, is suppressed by MCP-1 (22). In the present study, we examined the potential role of MCP-1 in the process of monocyte differentiation into DCs. We demonstrate that MCP-1 significantly regulates the IL-12-producing capacity of monocyte-derived DCs by a mechanism that is resistant to pertussis toxin. Human recombinant GM-CSF and IL-4 were kindly provided by Kirin Beverage (Tokyo, Japan) and Ono Pharmaceutical (Osaka, Japan), respectively. MCP-1 and macrophage-inflammatory protein-1α (MIP-1α) were purchased from PeproTech (London, U.K.) (lot-specific endotoxin concentration was <0.1 ng/μg). Staphylococcus aureus Cowan strain I cells (SAC) were supplied by Calbiochem (La Jolla, CA). FITC-dextran and pertussis toxin were obtained from Sigma-Aldrich (St. Louis, MO) and Wako Biochemicals (Osaka, Japan), respectively. FITC-conjugated mAbs specific for CD83, CD86, MHC class II, and CCR2 were purchased from Ancell (Bayport, MN) and DAKO Japan (Kyoto, Japan), respectively. Anti-CD40 and anti-CD1a mAbs were purchased from BD PharMingen (San Diego, CA). CD40 ligand (CD40L)-transfected L cells were a kind gift from Dr. G. Delespesse (Montreal University, Montreal, Canada). RPMI 1640 (Nissui Pharmaceutical, Tokyo, Japan) was supplemented with 100 U/ml penicillin G, 100 μg/ml streptomycin, 300 mg/L l-glutamine, and 10% v/v FCS (Sigma-Aldrich). Highly purified monocytes (>95% CD14+) were obtained from buffy coats of healthy volunteers as described previously (23). Briefly, PBMC were separated by Ficoll-Paque Plus (Amersham Pharmacia Biotech, Little Chalfont, U.K.). Monocytes were enriched by cold aggregation and deprived of T and NK cells by rosetting with SRBC treated with 2-aminoethylisothiouronium bromide (Sigma-Aldrich). Enriched monocytes (5 × 106 cells/well) were cultured in a plastic six-well plate (Falcon, Rutherford, NJ) for 30 min followed by the removal of trace numbers of nonadherent cells. The adherent cells were cultured in 1 ml of RPMI 1640/FCS supplemented with 40 ng/ml GM-CSF and 40 ng/ml IL-4 in the presence or absence of MCP-1 (40 ng/ml) or MIP-1α (40 ng/ml) at 37°C. One milliliter of fresh medium containing GM-CSF, IL-4, and the chemokines was added on day 2, 1 ml of medium was replaced with fresh medium containing the cytokines on day 5, and nonadherent cells were harvested on day 7. Microscopic analysis showed that >98% of nonadherent cells had cellular projections. Analysis by flow cytometry revealed that the preparations consisted of a homogenous (>96%) population of CD2−CD14low/−CD16−CD40+CD54+CD86lowCD83low/−HLA-DR+ large cells and <1% of CD3+, CD19+, or CD56+ cells. DCs generated in the presence or absence of the chemokines were extensively washed with PBS three times. Cells (0.5 × 106 cells/ml) were then stimulated with SAC (0.2%) or irradiated CD40L-transfected L cells (7200 rad, 0.25 × 106 cells/ml) and IFN-γ (50 ng/ml) in 0.5 ml of culture medium in a 48-well culture plate (Falcon). After 48 h of stimulation, supernatants were collected and stored at −20°C until assayed for cytokines. For measurement of mRNA expression, the cells were lysed after 6 h of stimulation and total RNA was isolated using the RNeasy kit (Qiagen, Hilden, Germany). CD4+ T cells were isolated from PBMC by MACS CD4 MultiSort kit (Miltenyi Biotec, Bergisch Gladbach, Germany), and CD45RA+ cells were negatively selected by depleting CD45RO+ cells with CD45RO MicroBeads using the protocol recommended by the supplier (Miltenyi Biotec). The purity of naive CD4+ T cells was assessed by flow cytometry using anti-CD4 and anti-CD45RA mAbs (Ancell) and was shown to be >98%. The T cells (1 × 106/ml) used as responder cells were stimulated with different numbers of monocyte-derived DCs in a final volume of 200 μl in a 96-well U-bottom plate (Falcon) for 4 days. Cell proliferation was assessed by adding 1 μCi/well methyl-[3H]thymidine (10 Ci/mmol; Amersham Pharmacia Biotech) during the last 16 h of culture. Triplicate cultures were then harvested onto glass fiber filters, and radioactivity was counted using liquid scintillation. Before the thymidine pulse, supernatants were collected and cytokine content was determined. IL-12 p70, IL-10, IL-13, and IFN-γ were measured by a two-site sandwich ELISA. Ab pairs and standard recombinant human cytokines for the ELISA were purchased from Endogen (Woburn, MA) and PeproTech, respectively. The detection limits for IL-12 p70, IL-10, IL-13, and IFN-γ were 15, 31, 31, and 15 pg/ml, respectively. First-strand cDNA was synthesized from 1 μg of the total amount of RNA using SuperScript II reverse transcriptase (Life Technologies, Gaithersburg, MD). PCR amplification of IL-12 p40, IL-12 p35, and β-actin was conducted using IL-12 p40, IL-12 p35, and β-actin primers. The primer sequences were as follows: for IL-12 p40, CCAAGAACTTGCAGCTGAAG (sense) and TGGGTCTATTCCGTTGTGTC (antisense); for IL-12 p35, AAGATGTACCAGGTGGAGTT (sense) and AGCTCGTCACTCTGTCAATA (antisense); and for β-actin, GATCAGCAAGCAGGAGTATG (sense) and ACACGAAAGCAATGCTATCA (antisense). Semiquantitative conditions were determined experimentally and nonsaturating conditions were verified using serially diluted cDNA mixtures. Ethidium bromide-stained PCR products were analyzed on 1.5% agarose gel by Chemi-imager (Alpha Innotech/Yaman, Tokyo, Japan). For more accurate quantification, mRNA levels were determined after reverse transcription by real-time PCR using TaqMan Pre-Developed Assay Reagents for gene expression quantification of human IL-12 p40, IL-12 p35, and β-actin (Applied Biosystems Japan, Tokyo, Japan). The change of reporter fluorescence from each reaction tube was monitored by ABI PRISM 7000 Sequence Detection System (Applied Biosystems Japan). The threshold cycle of each gene was determined as the number of PCR cycles at which an increase in reporter fluorescence was above a baseline signal. The difference in threshold cycles between the target gene and β-actin gives the standardized expression level (ΔCt). Subtraction of ΔCt of control from ΔCt of the MCP-1-treated DCs gives the ΔΔCt value that was used to calculate relative expression levels in the MCP-1-treated DCs with the formula 2−ΔΔCt. Mannose receptor-mediated endocytosis was measured as the cellular uptake of FITC-dextran (Sigma-Aldrich). DCs (5 × 105) were incubated in HBSS containing FITC-dextran (1 mg/ml) for 0, 30, 60, and 90 min. After incubation, cells were washed three times with cold PBS and fixed in 1% formaldehyde. The uptake of FITC-dextran was determined quantitatively by flow cytometry. All data were expressed as mean ± SEM. Differences between groups were examined for statistical significance using Wilcoxon matched-pairs signed-ranks test. A p value <0.05 denoted a statistically significant difference. Monocytes constitute an important pool of circulating DC precursors that are recruited at inflammatory sites by various chemokines, including MCP-1 and MIP-1α (24). We first investigated whether chemokines modulate the differentiation of monocytes into DCs. Monocytes were cultured with GM-CSF and IL-4 in the presence or absence of MCP-1 or MIP-1α for 7 days, and their surface markers were examined. As reported previously (23), cytokine-induced DCs expressed CD1a, trace amounts of CD83, and little, if any, CD14. 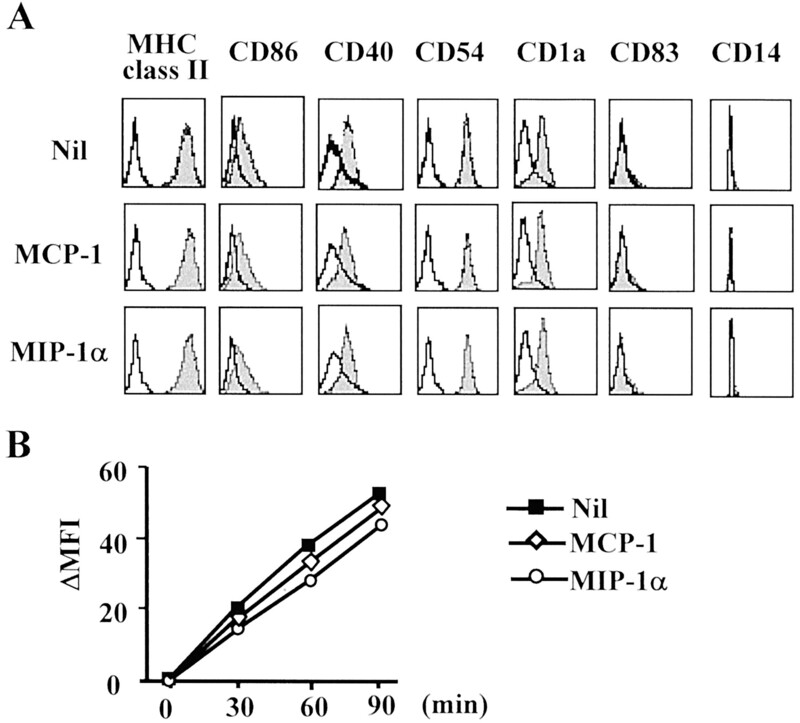 Neither MCP-1 nor MIP-1α altered the expression levels of CD14, CD83, and CD1a (Fig. 1⇓A). Moreover, there was no significant difference in the expression levels of CD86, ICAM-1, and MHC class II between DCs induced in the presence of MCP-1 (MCP-1-DCs) or MIP-1α (MIP-1α-DCs) and those induced in the absence of these chemokines (control DCs). Endocytic activity of DCs is closely associated with their maturation stage (19). As shown in Fig. 1⇓B, endocytosis of FITC-dextran by MCP-1-DCs or MIP-1α-DCs was similar to that by control DCs. Taken together, these data indicated that MCP-1 or MIP-1α did not affect the differentiation and maturation of DCs in terms of surface phenotypes and endocytic activity. Expression of surface markers and endocytic activity of DCs generated in the presence of MCP-1 or MIP-1α. Monocytes were cultured with GM-CSF and IL-4 in the absence or presence of MCP-1 or MIP-1α for 7 days. A, Cells were labeled with the FITC- or PE-conjugated mAb against indicated surface molecules (filled histograms) or isotype control mAb (open histograms). B, Cells were incubated with FITC-dextran for indicated periods, and the FITC-dextran uptake was determined by flow cytometry. Results are expressed as mean fluorescence intensity (MFI). Results are representative of three experiments. We next examined the production of cytokine by DCs generated in the presence of the selected chemokines. DCs were stimulated with either CD40L-transfected L cells or SAC, as T cell-dependent and -independent stimuli, respectively. 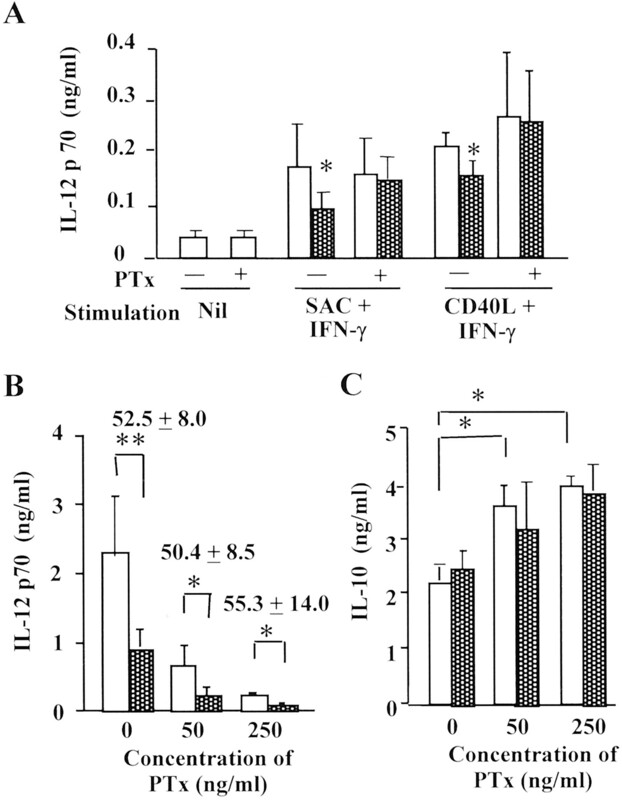 Because the levels of IL-12 p70 released from DCs stimulated with CD40L transfectants alone were too low to be detected by ELISA (data not shown), we took advantage of a study showing that costimulation with IFN-γ enhances IL-12 production of DCs (25). As shown in Fig. 2⇓A, when stimulated with a combination of CD40L transfectants and IFN-γ, MCP-1-DCs produced consistently less IL-12 p70 than control DCs (mean ± SEM: 70.2 ± 9.1% suppression; p < 0.001; n = 11), whereas there was no significant difference in the IL-12 p70 production between MIP-1α-DCs and control DCs. Most strikingly, the inhibitory effect of MCP-1 on the acquisition of IL-12 p70-producing capacity was not observed in response to stimulation with SAC alone or together with IFN-γ (Fig. 2⇓A). Unlike IL-12 p70, addition of MCP-1 or MIP-1α during the differentiation of DCs did not affect the acquisition of IL-10-producing capacity (Fig. 2⇓B). Cytokine production by DCs generated in the presence of MCP-1 or MIP-1α. 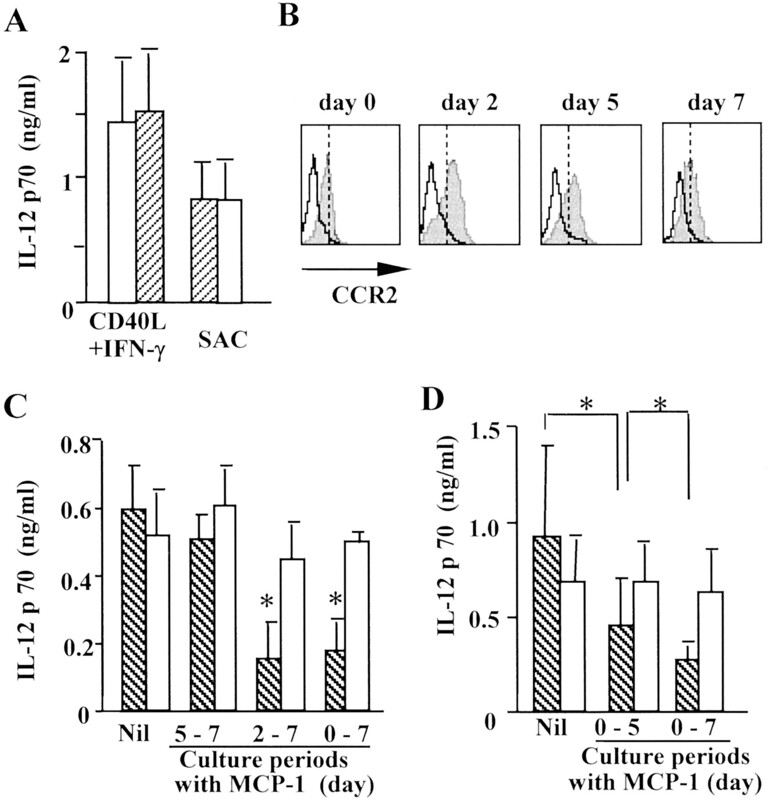 Monocytes were cultured with GM-CSF and IL-4 in the absence (open bars) or presence of MCP-1 (hatched bars) or MIP-1α (dotted bars) for 7 days, and the cells were stimulated with a combination of CD40L L cells and IFN-γ, SAC alone, or a combination of SAC and IFN-γ. After 48 h of stimulation, supernatants were tested by ELISA to determine the production of IL-12 p70 (A) and IL-10 (B). Shown are the mean ± SEM of 11 experiments. ∗, p < 0.001; nd, Not determined. To verify whether the inhibition of IL-12 production upon priming with MCP-1 was dependent on the CD40 signaling pathway, we measured IL-12 mRNA expression by DCs stimulated with CD40L transfectants in the absence of IFN-γ. As illustrated in Fig. 3⇓, MCP-1-DCs and control DCs constitutively expressed little, if any, IL-12 p40 and p35 mRNAs. After stimulation with CD40L, MCP-1-DCs expressed lower levels of IL-12 p40 mRNA (mean ± SEM: 54.3 ± 4.2% suppression (determined by real-time PCR); p < 0.01; n = 6) and p35 mRNA (mean ± SEM: 30.2 ± 9% suppression; p < 0.05; n = 6) than control DCs. Therefore, it was concluded that priming with MCP-1 suppressed CD40-dependent IL-12 production at both mRNA and protein levels. Effects of priming with MCP-1 on the expression of IL-12 mRNA by DCs. Monocytes were cultured with GM-CSF and IL-4 in the absence or presence of MCP-1 for 7 days, and the cells were stimulated with CD40L L cells alone. Total RNA was purified before and 6 h after stimulation, and the expression of IL-12 p35 and p40 mRNAs was determined by RT-PCR. The PCR products were electrophoresed in 1.5% agarose gel (A). Gene expression levels of MCP-1-DCs (1, 3, and 5) and control DCs (2, 4, and 6) after stimulation with CD40L were quantified by real-time PCR analysis (B). Reporter dye fluorescence of IL-12 p35 (1 and 2), p40 (3 and 4), and β-actin (5 and 6) is plotted on the y-axis (ΔRn) and cycle number is plotted on the x-axis. The results are representative of six experiments. Our findings, in agreement with Braun et al. (22), that the addition of MCP-1 at the time of DC stimulation did not suppress IL-12 production (Fig. 4⇓A) prompted us to examine the expression of CCR2 and the effect of MCP-1 over time, during the 7-day culture of monocytes with IL-4 and GM-CSF. As seen in Fig. 4⇓B, the expression of CCR2 was up-regulated during the first 2 days of culture and then gradually decreased. Interestingly, low but significant levels of CCR2 were consistently detected on DCs (at day 7), despite the fact that these cells were refractory to the suppressive effect of MCP-1 on IL-12 production. Similarly, addition of MCP-1 during the last 2 days of culture (days 5–7), when CCR2 levels were still relatively high, did not affect the IL-12-producing capacity of DCs (Fig. 4⇓C). In keeping with these findings, the presence of MCP-1 during only the first 5 days of culture was sufficient for IL-12 inhibition; however, maximal suppression was observed when MCP-1 was present during the entire 7-day culture period (Fig. 4⇓D). Finally, the addition of MCP-1 could be delayed to day 2 without altering its suppressive activity (Fig. 4⇓C). Kinetic studies. A, DCs were stimulated with a combination of CD40L L cells and IFN-γ or SAC in the presence (hatched bars) or absence (open bars) of MCP-1. B, CCR2 expression on the cells cultured with GM-CSF and IL-4 without MCP-1 was determined by staining with either anti-CCR2 mAb (filled histograms) or an isotype control mAb (open histograms). C, MCP-1 was added at day 0, 2, or 5 to IL-4- and GM-CSF-supplemented cultures of monocytes. D, Monocytes were cultured with GM-CSF, IL-4, and MCP-1. On day 5, the cultures were washed and then replated with GM-CSF and IL-4 in the presence or absence of MCP-1. Control DCs generated in the absence of chemokines were also washed and recultured. In C and D, DCs were washed on day 7 and stimulated with either CD40L L cells and IFN-γ (hatched bars) or SAC (open bars). IL-12 p70 was measured after 48 h of stimulation. Shown are the means ± SEM of four experiments. ∗, p < 0.05. As previously reported (22), we found that MCP-1-mediated suppression of IL-12 production by monocytes was sensitive to pertussis toxin (Fig. 5⇓A). To determine whether or not the suppressive effect of MCP-1 on IL-12 production observed in our study was also dependent on the same signaling pathway, DCs were generated in the presence or absence of pertussis toxin and MCP-1. After 7 days of culture, cells were extensively washed and stimulated with CD40L transfectants together with IFN-γ. As shown in Fig. 5⇓B, DCs generated in the presence of pertussis toxin alone showed reduced production of IL-12 and enhanced production of IL-10 (p < 0.05). MCP-1 treatment further suppressed IL-12 production but did not affect IL-10 production (Fig. 5⇓C). Thus, these data indicated that the effects of MCP-1 on the acquisition of IL-12-producing capacity are not sensitive to pertussis toxin. Effect of pertussis toxin on MCP-1-mediated IL-12 suppression. A, Monocytes were cultured for 2 h with or without 250 ng/ml pertussis toxin and then stimulated with CD40L L cells and IFN-γ or SAC and IFN-γ in the presence (hatched bars) or absence (open bars) of MCP-1. B and C, Monocytes were cultured with GM-CSF, IL-4, and the indicated concentrations of pertussis toxin, in the presence (hatched bars) or absence (open bars) of MCP-1 for 7 days. Cells were then extensively washed and stimulated with CD40L L cells and IFN-γ. After 48 h of stimulation, supernatants were tested for their content in IL-12 p70 (A and B) and IL-10 (C). Shown are the means ± SEM of four experiments. Percentage of suppression by pertussis toxin treatment is indicated as the mean ± SEM. ∗; p < 0.05, ∗∗, p < 0.01. Because DCs play an exclusive role in the activation and differentiation of naive T cells, we examined the ability of MCP-1-DCs to stimulate allogeneic naive T cells. As expected from the results in Fig. 1⇑, there was no significant difference in cell proliferation between naive CD4+ T cells stimulated with MCP-1-DCs and those stimulated with control DCs or MIP-1α-DCs (Fig. 6⇓A). 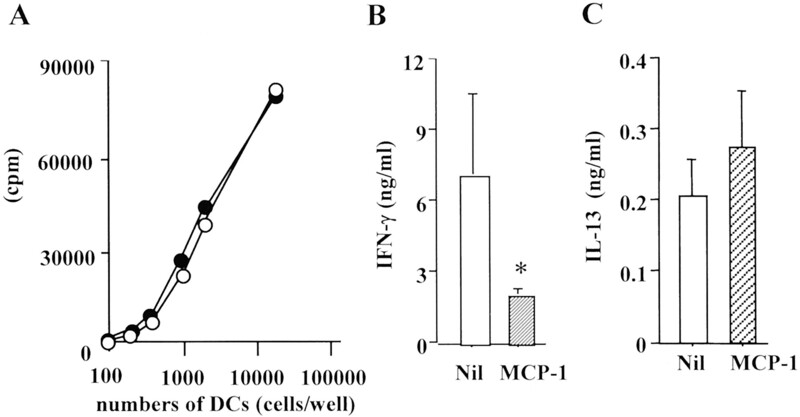 Consistent with the IL-12-producing capacity of the various DCs used in these experiments, naive CD4+ T cells stimulated with MCP-1-DCs produced much less IFN-γ than those stimulated with control DCs (Fig. 6⇓B). Most interestingly, MCP-1-DCs and control DCs induced the same levels of IL-13 production by the naive T cells (Fig. 6⇓C). IL-4 was not detectable in the cultures of the naive T cells stimulated with either MCP-1-DCs or control DCs. Thus, these data indicated that MCP-1-DCs inhibited Th1 cell development without increasing Th2 cytokine production. Effect of MCP-1 on the acquisition of T cell stimulatory activity of DCs. Monocytes were cultured with GM-CSF and IL-4 in the absence (○ and □) or presence (• and ▨) of MCP-1 for 7 days. Cells were then extensively washed and various numbers of the cells were cocultured with allogeneic naive CD4+ T cells (2 × 105 cells/well). Cell proliferation was determined by thymidine uptake in triplicate cultures (A). IFN-γ (B) and IL-13 (C) production were measured in supernatant of T cells cocultured with 2 × 104 cells/well DCs. Shown are the means ± SEM of five experiments. ∗, p < 0.05. In the present study, we showed that MCP-1 significantly regulated the in vitro differentiation of IL-4- and GM-CSF-stimulated monocytes into DCs. MCP-1 did not alter the morphologic appearance of DCs (not shown), their surface phenotype, or their endocytic activity but did markedly and specifically suppress their production of IL-12 in response to CD40 ligation. Indeed, MCP-1-treated DCs produced normal levels of IL-12 in response to bacterial products (SAC), and, moreover, their production of IL-10 was constant regardless of the stimulus. Consistent with the reduced IL-12 production, naive CD4+ T cells activated by MCP-1-primed DCs produced low amounts of IFN-γ, but normal levels of IL-13, compared with control DCs. MCP-1 is known to play a key role in the accumulation of monocytes in inflammatory sites and may also participate in their constitutive recruitment to peripheral tissues during steady state (14). It is of note that transgenic mice overexpressing MCP-1, under the keratin promoter, show local accumulation of cells with DC morphology in the basal layer of the epidermis (26). This accumulation may result from the direct recruitment of immature DCs or the migration of monocytes followed by local differentiation to DCs. Our results suggested that, in addition to recruiting monocytes at inflammatory sites, MCP-1 also regulates their differentiation into DCs. In contrast to monocytes, contradictory results have been reported in terms of the biological activities of MCP-1 on DCs, such as calcium influx and chemotaxis (27, 28). In the present study, the late exposure to MCP-1 during the induction of DCs did not affect the acquisition of IL-12-producing capacity despite the significant, albeit low, level of CCR2 expression (Fig. 5⇑). Given that mature monocyte-derived DCs lose CCR2 expression (29, 30), it is likely that the MCP-1 signaling pathway becomes less functional during DC maturation. Hence, early exposure to MCP-1 seems critical in dictating the functional phenotype of DCs. MCP-1 might inhibit the acquisition of IL-12-producing capacity by inducing the production of IL-10, TGF-β1, or PGE2 during the cytokine-driven differentiation of monocytes into DCs (31). However, IL-10 levels in the MCP-1-priming culture were very low and similar to those in control cultures (data not shown), and IL-10 would have allowed monocytes to differentiate toward CD14+CD1a− macrophages rather than DCs (32). Consistent with the notion that IL-10 is the most potent autocrine inhibitor of proinflammatory cytokine production (31, 33), neutralization of endogenous IL-10 upon stimulation enhances IL-12 p70 production even without MCP-1 treatment (Ref. 22 and data not shown). Thus, neutralizing experiments by anti-IL-10 mAb did not lead to a conclusive role of endogenous IL-10 in the MCP-1-mediated suppression of IL-12 production. TGF-β1, which favors the differentiation of monocytes into Langerhans cells, down-regulates IL-12 production by DCs stimulated with bacterial products but not CD40L (34). PGE2 enhances the expression of costimulatory molecules on DCs and increases their ability to stimulate T cells (35). Based on these considerations, none of the above factors alone could fully explain the inhibitory effect of MCP-1 on IL-12 production by DCs. However, further studies are required to formally rule out the involvement of these factors in the present observation. Several studies demonstrated the physical association of pertussis toxin-sensitive Gαi to several chemokine receptors, including CCR2 (36). Consistent with a previous report (22), MCP-1-mediated IL-12 suppression of monocytes was sensitive to pertussis toxin treatment, whereas the effect of MCP-1 on the acquisition of IL-12-producing ability of DCs was not (Fig. 5⇑). Given that CCR2 receptor couples to multiple G proteins and the coupling is cell type specific (37), the effect of MCP-1 on DC differentiation may be attributed to pertussis toxin-insensitive G proteins, such as Gqα or G16α. Because MCP-1-deficient mice show reduced Th2 response, whereas CCR2 knockout mice have markedly reduced Th1 response, the phenotypic discrepancy between the two types of mice suggests that there is a second, as-yet-unidentified receptor for MCP-1 whereby Th2 responses are induced (38). In this context, MCP-1 might inhibit IL-12 production by DCs via another Gαi-uncoupled receptor. The difference in signal transduction machinery between monocytes and DCs may also explain the different inhibitory effect of MCP-1 on IL-12 production induced by SAC plus IFN-γ. The inhibitory effect of MCP-1 on IL-12 production by DCs was exclusively observed in response to CD40 stimulation but not SAC stimulation. Moreover, MCP-1-mediated inhibition of CD40 signaling did not interfere with all signaling pathways emanating from CD40, because CD40-induced IL-10 production and up-regulation of costimulatory molecules were not impaired by MCP-1 (Fig. 2⇑ and data not shown). McRae et al. (39) reported that, similar to MCP-1, IFN-β selectively inhibits CD40-dependent IL-12 secretion by DCs without affecting LPS-dependent cytokine production. It has been shown that engagement of human IFN-1R results in the activation of tyrosine kinase-2 and STAT3, as well as STAT2 (40), and that CCR2 dimerization recruits Janus kinase 2 and STAT3 (36). Although the molecular mechanism whereby IFN-β regulates IL-12 production has not been determined, it is possible that MCP-1-mediated inhibition may use similar mechanisms. Further study is required to clarify the precise mechanism. After Ag uptake, DCs undergo maturation and migrate from peripheral tissues to the paracortical T cell zone of the draining lymph node within 24 h (41). Our results showed that the MCP-1-induced decrease in IL-12 production by DCs was preserved for 2 days after removal of the chemokine (Fig. 4⇑C), suggesting that the IL-12-producing potential determined in the peripheral tissues persists in DCs present in lymphoid organs. Several studies demonstrated that mature DCs produce conspicuous amounts of MCP-1 (42) and lose functional CCR2 expression (29, 30), and that high levels of MCP-1 are detected within lymphoid tissues (15). MCP-1 produced in peripheral inflammatory sites seems to influence DCs, whereas that produced in lymphoid tissues will not affect cytokine production by mature DCs. Several in vitro and in vivo studies have shown that MCP-1 acts at various steps of T cell differentiation and may influence T cell effector function (4, 7, 8, 14, 15, 16, 17, 18). Furthermore, MCP-1 may or may not enhance naive CD4+ T cell differentiation into Th2 cells (4, 6). Our study suggests another scenario; i.e., MCP-1 indirectly suppresses naive T cells to differentiate into Th1 effector cells by modulating the ability of DC to produce IL-12. Because DCs in the respiratory mucosa function as major APCs during secondary as well as primary immune response (43), MCP-1-primed DCs may also suppress the effector phase of Th1 response in peripheral inflammatory sites. More recently, Traynor et al. (44) reported that MCP-1 can promote both Th1 and Th2 responses in vivo depending on the timing of MCP-1 induction, type of pathogen or Ag, route of inoculation, and the tissue site. In keeping with the findings, MCP-1 may interfere with Th1-mediated responses where IL-12 secretion is predominantly dependent on the CD40/CD40L pathway, but not with the innate immune response of DCs to Gram-positive bacterial infection. In conclusion, the present study documented the regulatory role of MCP-1 in the differentiation of monocytes toward DCs. The present findings suggest that MCP-1 supplies an important immunomodulatory signal to DCs and that the modulatory effect of MCP-1 may also dictate the cytokine profile in Th response induced by DCs. Further investigation of the role of chemokines in regulating DC function will have important practical implications for the use of chemokine antagonists in the treatment of allergic and autoimmune diseases. ↵1 This work was supported by grants from the Pollution-Related Health Damage Compensation and Prevention Association. ↵2 N.O. and M.Y. contributed equally to this work. ↵4 Abbreviations used in this paper: MCP-1, monocyte chemoattractant protein-1; CD40L, CD40 ligand; DC, dendritic cell; MIP-1α, macrophage-inflammatory protein-1α; SAC, Staphylococcus aureus Cowan strain I cell; MCP-1-DC, DC induced in the presence of MCP-1; MIP-1α-DC, DC induced in the presence of MCP-1α.